Iâve am fairly new to this podcast but I think Iâve learned more about art than I ever learned in college art classes. The podcast covers current exhibitions and expands your understanding of the work when you go to the exhibitions. The podcast makes you aware of current exhibitions that may not be in your immediate environment. Thereâs very frequently a connection to art history and current exhibitions. Also Tyler covers art history in general. The format of the conversations is intelligent. I have and will continue to recommend the podcast to others. Iâm an art lover. BUT. Interviewees are SO pretentious sounding. Iâve tried to listen to several of these, and all I can think is how pretentious the people are. Itâs what gives the art world a bad name. Itâs a turn-off even for art lovers like me and will do nothing to help promote the value of art to anyone in the real world. Disappointing. I subscribe to several podcasts that focus on the visual arts, and this one is the best. Tyler Green is informed and, as a result, an expert interviewer. I live on the West Coast, and I appreciate that he covers artists and exhibits across the country. Sometimes I listen to a podcast twice because I want to make sure I didn't miss anything. This podcast is great to find out more about how artists think (and thru that better understand their artwork). Wonderful way to get inspiration if you have a long commute and to keep up with whoâs important in the art world. This podcast is a must thanks to Tylerâs amazing interviewing skills. He obviously knows what heâs talking about and asks intelligent questions, often prompting his incredible array of guests to think about their work in a different way. I really like this series. Iâm going to listen to all of them over the next couple years. I donât have a problem with the sound, but I listen on my phone with ear buds. Maybe the previous reviewer doesnât.I expect Iâll be getting a good education here. I use Modern Arts Notes Podcast as listening on long commutes & drives. So much insight with each episode. Sometimes art can feel like an overwhelmingly vast and forbiding cultural ocean, even for die-hard fans. Modern Art Notes is one of the best resources to bring both the deep past and far-flung future of art into a human scale. Tyler's curiosity and ernest love of art is infectious, as facinated and passionate about the nuances of 14th century Italian Rennaisance painter studios as he is about the conceptual manuevers of contemporary video art. It would hardly be uncommon to have both subjects paired in a episode. Also, I know some folks have complained about sound quality, but many of his guests are amongst the most known artists and curators spread across the world, and getting direct access to their voices and ideas is too much of a rare treat to fret about a bit of fuzzy recording from a 80-year old master artist who only has a land line or whatnot! 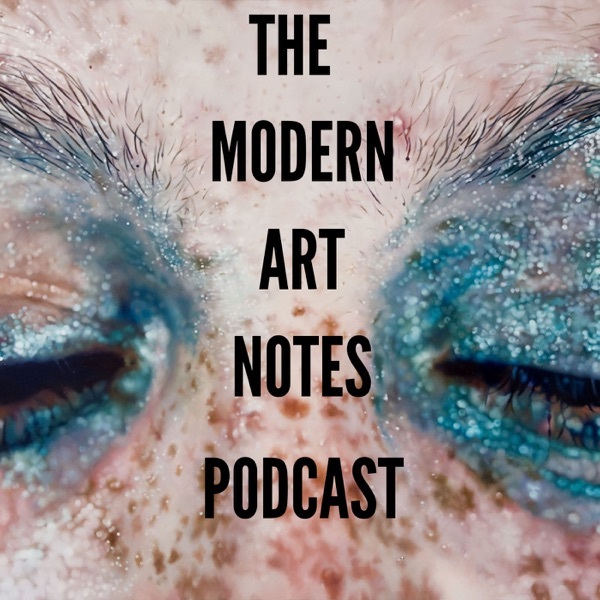 The Modern Art Notes podcast is an extraordinary ongoing installment of thoughtful and thorough examinations of artists, their work and the world they create. Host Tyler Green is not afraid to probe into the intention behind the work and frequently receives thought-provoking answers from the creators of such work. In an art world that is frequently more consumed with the superficial, Tyler continues to reach for the human and authentic elements that can make art so worthy of discussion. this podcast is filled with pertinent information, wonderful interviewsâ¦ Feels like I am in art school when I listen. Just found this podcast and am catching up on past interviews. Tyler Green does an excellent job as an interviewer, connecting the dots with his questions and insights. Am consumed with regret that I let so many great museum shows pass me by...will be ordering catalogues to compensate, and pledge that now that I am in the loop with MAN I will visit more! Having sampled many podcasts, I can say that although the sound quality is a bit rough in spots, it is quite acceptable. Through, wide scope, researched and exceptionally well done. A feast of information and insight. Mr. Green has great interviewing skills with both artists and curators- listen and enjoy. Don't forget the supporting website. A+. I really enjoy this podcast. As an artist I listen for historical insight but also for those questions that draw the artist out in a new directions, questions that allow them to discover something about their art through the conversation, which is very differnt than looking at your own work critically. As an arts educator I recommend this podcast to all my Art & art history students. Tyler Green is erudite while having a conversational style that's approachable and informative. Great guests! A must for anyone culturally curious. Tyler definitely does his homework, hosting consistently excellent interviews with some of the best living artists around. The best art related podcast Iâve known! These interviews are indelible part of my studio routine. I get there, switch on the podcast and start working. always so informative and inspiring. Fascinating and enjoyable conversations, some are sparklingly brilliant and illuminating. Tyler Green is an excellent art journalist - a great appreciator and an awesome listener. This podcast really is an invaluable show for anyone interested in art. There is no other podcast like it and I look forward to it each week. Tyler knows his stuff. I've been listening to these thoughtful interviews for over a year now. Tyler does a great job of making an occasionally obtuse topic easy to understand and relatable by using accessible vocabulary and clarifying occasional difficult ideas with great context and great interview questions. Love it- a must listen for anyone who wants to have an insight into artistic practice and art historical context. Thanks for all your hard work, Tyler! An excellent podcast, providing informed, well researched interviews with artists, curators, and organizers of contemporary exhibitions or catalogues. Insightful as an interviewer, Mr Green allows his guests to speak freely while also carefully navigating them through his agenda. Sound could be improved, but this lower quality forces me to listen again and catch more. And, these interviews are timely, allowing audiences to seek out exhibits in person or as a nightcap to a show already seen. Tyler Green is da bomb! Tyler Green does his research and asks thoughtful questions. The he really listens to the answers before offering follow up questions. Modern Art Notes is the best art podcast happening today. I listen over and over when I'm working in the studio. If you love art and want to keep up to date on exhibitions and trends in Contemporary Art this is a wonderful podcast. Professionally produced. Good interviews and an impressive roster of guests. Wonderful inteviews with artists, exhibiton curators, museum professionals, gallerists, and others persons of interest in the modern and contemporary art world. A great way to hear about must-see exhibitons in the U.S. This is the best podcast in the US that covers topics related to art, museum exhibitions, and museum culture. Each week it's something new and good. Definitely worth subscribing! Timely interviews and compelling analysis. A true gem in the world of art. The only modern art podcast! Incredibly relevant and insightful! My favorite part about it is when Tyler asks a question that is so thoughtful and relevant that even the guest is astonished at how meaningful of a question it is. The type of question that stumps them for an answer, but surely makes him or her think about it for days after the interview. Tyler Green brings out the best from his well chosen guests. You'll get a fresh, independent view on tiday's art scene and insight into key artists and shows. The Modern Art Notes podcast offers insightful interviews with well known artists. This podcast is smart and accessible to the long time art appreciator or for anyone who is interested in broadening their understanding of modern art. The host, Tyler Green, does not shy away from difficult subject matter, and he also remains respectful of his guests. This is perfect unwind from work with a cup of coffee and get mentally stimulated. Can't wait to see the Serra show at the menil. The sound quality is poor and suffers from what sounds like low quality recording equipment. Its a shame because Mr. Green has access to some great guests but the two podcasts I have listened to âSnapshot: Painters and Photography: Bonnard to Vuillard.â and Richard Serra are both almost unlistenable.